We are really used to seeing the same designers, the same catwalks, the classic and striking that year after year all fashion media present us omitting completely large proposals that usually many manage to see only being there. Sure, we know that in weeks of fashion like New York we love the imminent change of brands like Calvin Klein, or let us fall in love with the staging of Tory Burch but as I said in my previous post everything has changed, and NYFW is full of new proposals that I know that in Latin America we are far from knowing them (yet). That’s why I wanted to make this post where more than saying my impressions or saying if it was cute or wonderful etc, I want you to know these brands and learn something new from the industry today, I want if some designers or entrepreneurs are reading this look for inspiration in them because I promise that they can get everything to be clearer than any great brand or designer we know. It should be noted that these brands and designers are not small, are great in their own way, in their niche, in their countries and in conceptualization, believe me, they are giants, some with a great career and a number of publications, others a little more beginners but in truth there is already much to take from them. His ultimate inspiration for this collection: Juan Gabriel, with this I think they may be dying of love for this Ecuadorian who surprised with a large number of male looks showing how he calls this icon style that left marked more than a generation. The music on his catwalk was gold to my ears. For many the most emblematic brand of this generation, Chen Peng under the creative direction of Peng Chen is inspired by the one size for all, showing the duality between the beautiful and the ugly but maintaining the personal style. 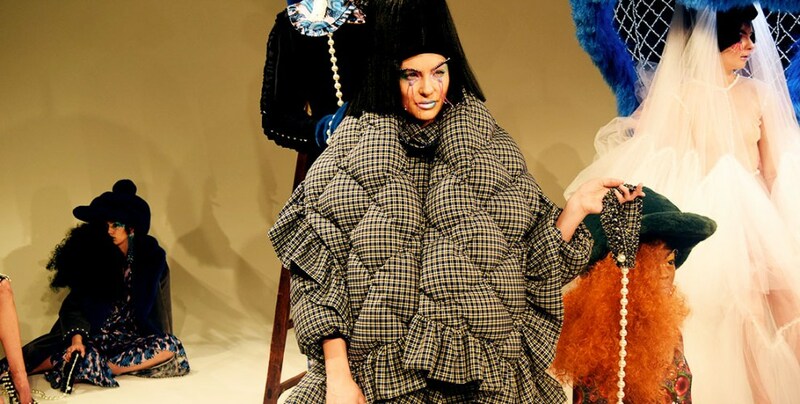 Her collection was inspired by a client who asked for the largest jacket she had. Although I could say that it is one of the best known in this list, Christian I fell in love with his collection, between textile games and striking colors. Cowan was inspired by a whole escapism as much as a date with Amy Winehouse. I can say that I am a faithful follower of the presentations, many times the recursion is everything and although I know that Claudia Li did not need it, she knew how to do it very well with totally basic elements. This creator took me on a long journey while walking in front of each of her models where they could find Mongolian sheep and classic pieces totally reinvented. If there are favorites here is Concept Korea, the group that returns to show two designers that definitely have to know, LIE and GREEDILOUS, two talents of South Korea sponsored by this group since 2010 (usually in each show there are different designers) . LIE was inspired by an image of a polar bear on an iceberg speaking clearly about global warming. GREEDILOUS, on the other hand, was inspired by women, more towards an aesthetic like Marie Antoinette and Versailles. Coincidence that Greta was also presented? I do not think so! Once again I have proof to say that we should apply this in Colombia because she opted for a two-story space where bright models were the protagonists, a lot of glamor and among her special guests was Coco Rocha. His collection was inspired by the empowerment of the 80s, yes, again we see the strength with which returns this time. A lot of spangle, a lot of brightness, a space that was divided between the future and the past. There are young people in this list and Naeem Anthony, wow, I swear I’m speechless with this man, I barely knew him I said that this is so precious cultural, that is precisely his secret, his clothes are like trips between cultures, feelings and many emotions. Colors and prints are the key to this designer. Ahh and also Helen was her grandmother. Under the creative direction of Justin Yu-Ying Chou, this Taiwanese brand presented “SuperlinXX” inspired by a collaboration with the National Museum of the Taiwan Palace, reinterpreting the art of the Chinese empire and bringing it to a reality, street style. This brand has 3D virtual fitting for its buyers. From my favorite presentations and I know that also from several of my followers on Instagram, Laurence and Chico also brings together an Asian aesthetic brought to the reality of street style, that is to say what we all want. From the most kind and adored designers during their presentation. If they wanted to know a brand from New York, here they are, this creator is inspired by all the follies of his city, New York, taking to each one of the pieces his people, his culture and his humor. Her first Manhattan Knights collection was in 2015. This collection was inspired by the past times of NYC, disarming an old wardrobe to take it to the world today. And for lovers of the game of genres and the limits between the feminine and the masculine Moon Choi is the perfect brand for this, because the design and architecture is reflected in each of their garments that break with the classic schemes despite to have a pretty vintage wave. Currently one of the seven designers recommended by VOGUE. And I could not miss a well Danielastyling brand, a brand that does not fear the world and that could be criticized in Latin America, this brand fascinated me, its show was one of my favorites and just by seeing the photos you will understand why. I have no important data, I did not find much info from the creator. The first brand that dazzled me in the fashion week, was part of NYFW’s China day and I presented its collaboration with Coca Cola with a totally eighties and nineties inspiration that sought to redefine contemporary Chinese fashion. This brand had already presented them in September, because they also made a presentation and we were covering. In this season they joined together with Samsung to highlight the matriarchal system in order to connect women around the world, having as a principle the androgyny and textiles with high technology. Artistically inspired by Natalie du Pasquier and Barbara Radice, who gave birth to the art deco movement of The Memphis Group. And last but not least, Ricardo Seco, this man deserves EVERYTHING, his collection beyond having a perfect aesthetic leads to reality messages with anti-Trump phrases like “You can call me DACA but I am the result of a dream come true… I’m American. ” Without words, they will follow this Mexican because they will love him. Seco is a man of messages, close and reaffirming that fashion IS FOR MESSAGING. This was all for today, sorry for the delay of this post, I confess that it is very special for me to bring you this information. Tell me if you already knew them and what was your favorite?